We have hopped into 2015 with all the thrills and frills anticipated for the year. The prophets have spoken and the game continues. The elections are fast on our heels and the soothsayers won’t stop talking. Everyone wants to take sides and certainly no one wants to fall on the losing side. Already the politics of ethnic alienations is playing out. Calculations are ongoing and pragmatic efforts taken on the most concrete opposing sides in our political game. Who would bear the tag “doro.” Will it be APC or PDP? Those who have the capacity at political mathematics understand the magnitude of our political calculations and how slim the final solution may be for the side that will manage to carry the day. If internet surveys and blog discussions are anything to go by, it seems the APC will have a field day at the presidential election. PDP has being silent so far on the internet or perhaps they have being bullied out of the scheme of things. Politicians are heavily busy with strategies. They had the opportunity with Christmas and New Year to seize the giving season to state their capacity at giving out the normal bags of rice and jerry cans of oil that Nigerians love to be bought over with. Some even added chicken and did street dole outs. Who wouldn’t vote for such heavy spenders? Masses don’t like those who are not ready to spend. That was why President Jonathan had to launch for support for his political bid early on before Christmas as he knew the extent of hand changing that will have to go round during the season if he had any chance of winning. Don’t be surprise if incoming governors find state treasuries empty. The treasuries have being milked dry for elections to push the candidacy of the present governors’ choices. Politics isn’t how eloquent you are. You don’t have to try convincing people of your capacity once you can dance to the song “dorobucci” and throw some money to the crowd of spectators. They will attest to your capacity to govern them. Don jazzy and his Mavin crew found the right time to release their “doro”. If you can’t sing and dance the doro, you may not win these elections. Those who are yelling at a particular choice now know what can happen over a plate of meal, a bag of rice, a big hen and twenty thousand naira. They would turn their backs on their ethical candidate. We are Nigerians not Americans. What money cannot do, more money will do. The foundation of our political system has being well grounded on the mathematics of money flow. Nigerians know how to sell their brains and brawn to the best bidder. Play us the money music! They will yell and get dancing to the rhythm of the politicians. Thank God we have very creative musicians with supernatural talents. They are certain of a great showdown as they create sassy flowing rhythms in praise of our politicians. Nigerians love music and when those great politically motivated shows storm our state capitals, we can be sure it would be free with the entire crowd coming around to cheer their political musical icons. It’s going to be a “doro” battle never before seen or heard across the black race. The main opposing sides seem to have what is needed, the lucre. When the doro dance step arrives everyone must dance. Staffs of companies owned by politicians are already dancing. They are being owed months of wages and can’t do a thing about it. They must join their master make the bestselling beats. If it will take their blood, it wouldn’t matter provided that oga’s beats has great airplay amongst the masses. For those who are debutants in this dance game, I am very sorry you came in when the music and the dance has reached increased heightened point. In this season of doropolitics, if you cannot stand the doro, just quit or face losing. The monumental struggle for political position by our politicians leaves so much distaste in our lips. This distaste has to be checked by the latest flavor of Henesee or champagne. Once that follows the fine doro beats, you can expect feverish dancing all the way. For those politicians who haven’t started the door to door campaigns as yet, take your time and raise the gargantuan amount needed for the venture. Na where monkey dey work na him him go chop. If you want my vote, scratch my back. Afterall after the election na enjoy you go enjoy inside air conditioned office. Nigerians know the truth. Once the politicians plead with them for the votes, they never often return to them to show appreciation. They make those who voted them look like faeces, they keep stone caged faces and they often look far from the smiling persons we had assumed they were when they came begging for votes. If you are smart enough, get what they can offer and more and if you like vote them. Don’t sell your vote but collect the money. It’s part of the doro philosophy. 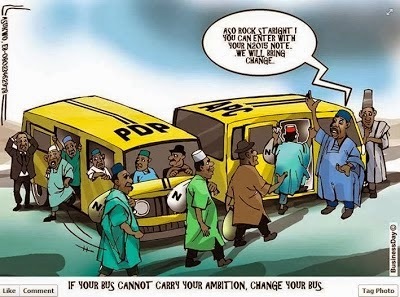 Doro Nigeria, doro politics, doro PDP, doro APC, all the voters doro. Who wants to doro? Those who are busy with the campaigns on TV and the internet are far from the real game plan. The doro game plan does not include the adverts on the internet; afterall, the bulk of voters can’t understand the big grammar that characterizes the internet. The internet is for the youths of which I am certain most won’t vote. They know in this doro game, heads go break so they won’t dare come out to die. The real campaigns is on the street where the politicians hold their party crested rice on one hand and a few thousands on the other and become gods almost immediately. You do know, Nigerians love you when you can give. That is why I fear for some candidates who don’t have enough. They will have to collect loans from banks and then pray they win. It’s not just about giving out what the people want. It is also giving it to the right people. The doro party is about how much people our politicians can attract at once. If you can sing well and the masses like your kind of song, well people go full any stadium for you so that you can scare the opposition. The size of stadium and the crowd of spectators that arrive the stadiums sends chills of fear over the opposition and it shows you are in good standing even when the world outside are against you. We know in this game, there can never be fair play. Who do you want to be fair to, the masses or the opposing party? Its fair play that has brought our political system this far and heads are rolling. There is no more fair play. Spend, let’s dance with you and roll our heads perhaps we can entice a few others to join us in this dancing spree. Doro has no mate. You can’t claim to be a politician if you cannot withstand the heavy political rancor that characterizes the game. You must strive to outdo. If the other person outdoes you, well that’s where the party will be at the end of the brouhaha. Those who are calling for debates are anti doro. Doro does not support debates. It would be pretty unnecessary in a nation of extreme illiteracy levels. Many watch movies but don’t watch national TV. They don’t care about what the politicians do or say. You may be surprised to know that most don’t even know there will be elections next year. Permit my idiosyncrasy; I’ve spent most of my last few years in the country side where the bulk of Nigerians reside. I’ve studied the traits and attributes of our country side dwellers. They will accept anything especially if the doro guys can play their way to their direction. They don’t need much convincing. Just throw them party logo crested wrappers and just one thousand. That’s how easy it goes. Now that the practice sessions for the real dance are still on, run come dance. In the real show, you will certainly get a chance. If you had no chance at Christmas and New Year, you will certainly have one before the elections begin. Doro is patient to ensure you also get your share of the package. Don’t just stand and watch, join the doro dance else you’d be left out.